Are we being "magic" enough? Are we walking away from our potential? Do we have to leave, go somewhere or seek out something in order to make things happen? What is the message? What are the messages? Astrologically, things (currently) continue to have a sort-of anxious under-and over-tone (depending). With Mars so close and so many planets retrograde, this is a confusing, twanged-up, tricky time for many of us. And this knowing, has left some of us a bit paralyzed: these cards are for us, especially. The Magician (Mercury) is equipped with all necessary to manifest, but unlike the Chariot, he’s not yet in motion: it’s pure potential. The Eight of Cups, however, is action…movement. This too, in the suit of Cups—meaning, movement on the behalf of love, alignment, action for self and/or the higher good of all. This week, consider what you have at hand. Consider what you need to gather in order to manifest from this place of pure potential. In weeks past, we’ve been clear that now is not a time to make big, critical or momentous decisions. 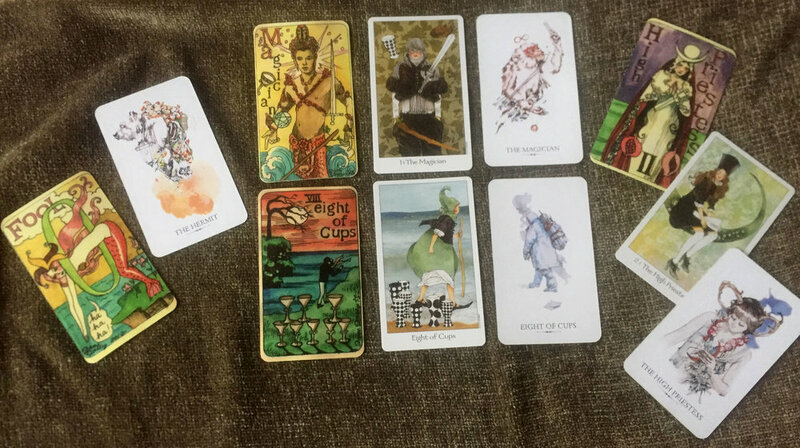 This holds…as the Eight of Cups is not a violent warrior but a calm seeker of that which must be sought. I call on the High Priestess, the Hermit and the Fool to assist us. • The Fool, to shake up our views and turn the upside down and backwards—so that we can see more clearly that which is possible…and that which we desire. The Fool helps us to have faith in the journey…and the directions the winds may blow and assist us (the Eight of Cups). The Fool helps the magical Magician in us to act and manifest—live our potential. The Fool visits the High Priestess who tips hat to the Hermit, so that we can walk our path which is our life and great journey in our time on this planet…as we know it. p.s., The picture shows some of the same cards from various decks. Please take the time to study the imagery: different artists and representations my speak to us, beg questions or offer suggestions. That is the beauty of our Tarot variety. p.s.s., Know that you are the owner of your journey. The "Moon-i-ness" reminds us that the answers are not always obvious. Dig deep. Avoid easy or obvious solutions. Get curious.